Post Challenge~ Thanks all! It's cool to get my first ribbon along with a message that my membership is set to expire shortly! (I'll be renewing) Now to dig up my original file! Shot this on a quick family vacation to the coast and had to process quickly with PS Elements(thankfully it is very similar to PS)on a borrowed computer to meet the 9:00 deadline. Oops, missed some dust spots! The tide was -1.1ft near sunset so the timing was perfect to catch the exposed grass/rocks. Held a too small cokin GradND filter with my fingers to even out the exposure. It's a beautiful coastline and even if the Pebble Beach Company 'owns' the tree and charges cars $9 to travel on their road, it's worth the trip. My favorite comment ever. "This is ribbony, but what is it really saying, anyway? Do my grandchildren need to see this?" Thanks, posthumous. I grew up in Carmel. When I was young, this tree had alot more branches...lol. Stunning photo and I'm marking it a fav!!! Brings back so many memories for me!!! What a beautiful photo of Pebble Beach! And I think it would be safe to tell Posthumous that "YES. Your grandchildren DO need to see this!!!!!" They need to learn early to appreciate the beauty of nature and "getting away" to the quiet places, away from the cell phones, fax machines, and computer games! This the kind of photo that takes you there! What a beautiful job. Congrats on your yellow! Whoa, what an amazing landscape! Love it! Love it! 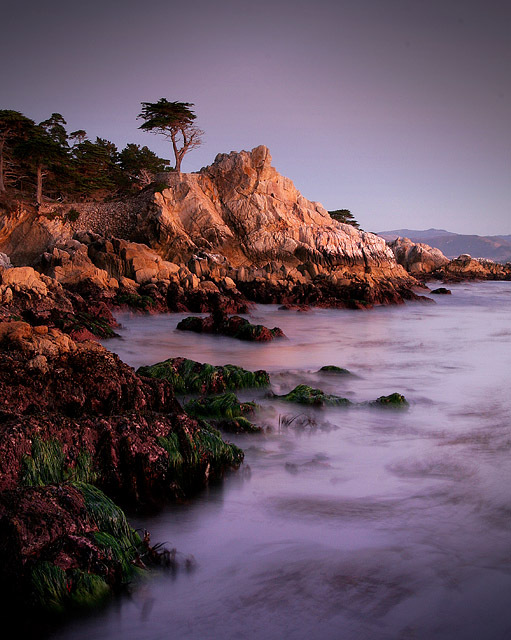 I used to live in Monterey, and I have to say, you have captured the Lone Cypress in quite a magical photo! Awesome!!!! Congratulations on your Ribbon with this Stunning view of the Pebble Beach coastline! Beautiful work!! Congrats on your ribbon! The lighting and colors are outstanding!! Way to go Mark! Nice shot...nice ribbon! great picture !! I'm still looking for those dust spots ! Top right. Hard to see on my work monitor. Shows up at home. Terrific shot Mark! Congratulations on your first ribbon! Fantastic photo. Congrats on winning the yellow ribbon. i loved this shot, and this was my high scoring image in the challenge. The lighting is just perfect! Congratulations on the yellow ribbon! Wonderful job. I'm still looking for that elusive ribbon...this one was well deserved. Pebble Beach never looked so good - you should show them your photo, might get a sale. Excellent shot, beautifully photographed. Yeah Mark, great shot!! and congrats on the first ribbon. Not a bad first week on the f-stops, next week I want a red! :P.
Congrats for your ribbon ! Well deserved for a beautiful photo ! Now speak about a lucid dream, I am having one looking at this image. Congratulations on your Yellow. Fantastic photograph, congrats on winning the yellow ribbon! Really amazing, lovely image! Congratulations! One week on the F/Stops! and you got yourself a ribbon!! Woo Hoo, WTG Mark! This is gorgeous!! Heck of a great time to get a ribbon, Mark! Big huge congrats. Wonderful colors and softness of the water! Hurray! excellent composition, focus, and lighting. very sweet. Too bad we cant depict the ebbing and flowing individually. I never tire of these types of photos with the blurred waves, especially when done as well as this. Very nice! Pretty without being excessively ethereal. 9. This is ribbony, but what is it really saying, anyway? Do my grandchildren need to see this? Lucky you - living in Monterey, I presume! I love that area. Beautiful, well-rendered photo. Lovely. I've come back to this several times. Really a beautiful image. The one craggy tree up on the cliff adds to it. Love the lavender of the water with the warm tones of the rocks. Add that to the touches of green and the whole image really gives the viewer a wonderful sense of color. Proudly hosted by Sargasso Networks. Current Server Time: 04/20/2019 04:33:50 PM EDT.